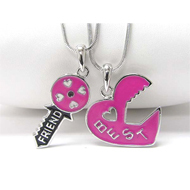 Lovers Message Tag Vermeil Sterling Silver Couple Necklaces Set. Lovers Jewelry Set! 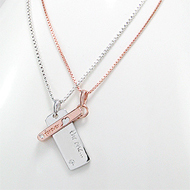 For Him: Tag Necklace "the one..." Message. 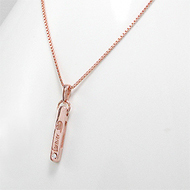 For Her: Tag Necklace With "forever..." Message. 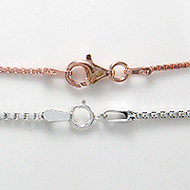 Both Jewels Are Made of Sterling Silver and Each is Set With a Single White Cubic Zirconia. Material : 925 Sterling Silver. Plating : 14k Pink Gold. Decorated With : Cubic Zirconia(CZ). Setting Type : Rub-In. Design : Message Tag, Name Tag. Big Pendant Size(Including Bail) : 10 x 30 mm (0.375 x 1.125 inch). Big Pendant Chain Length : 20 inch. Small Pendant Size(Including Bail) : 4 x 29 mm (0.125 x 1.125 inch). Small Pendant Chain Length : 18 inch. 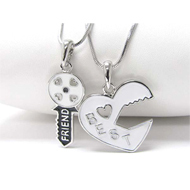 Lovers Message Tag Vermeil Sterling Silver Couple Necklaces Set. 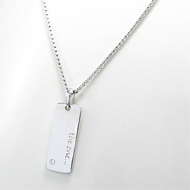 For Him: Tag Necklace "the one..." Message. For Her: Tag Necklace With "forever..." Message. 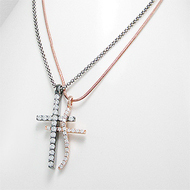 Both Jewels Are Made of Sterling Silver and Each is Set With a Single White Cubic Zirconia.